The very first quilt I can remember my grandmother piecing when I was a very little girl was Grandmother’s Flower Garden. She cut each piece with scissors using a cereal box template and sewed the fabric together by hand with 1/4″ seams. 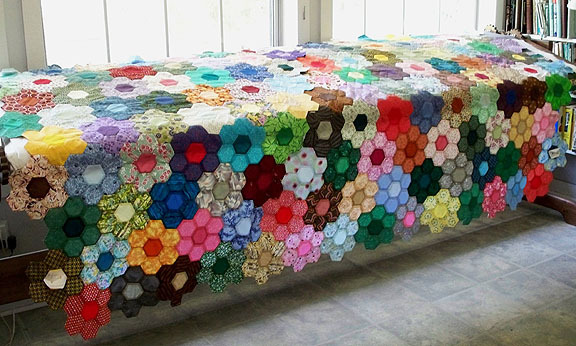 She made several of these quilts, usually using pink as the dominant color with yellow centers and green ‘paths’. In her honor, I decided to make a Grandmother’s Flower Garden, but was determined to learn to English Paper Piece for accuracy. It’s totally addicting and the top was made quickly. It waits for me to decide how I want to finish the edges… either with borders or partial blocks. The top is currently queen size. I’m a hexagons lover. Your work is beautiful. That is an amazing quilt top, Lady! I don’t think I’ve ever seen that pattern….Wow! It’s beautiful!